Garlic growers are harvesting their crop these days. 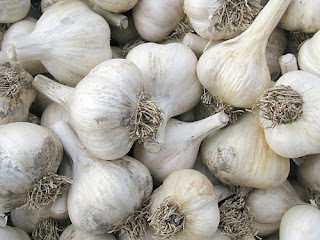 In general garlic may be harvested when the leaf tops begin to discolor and dry. 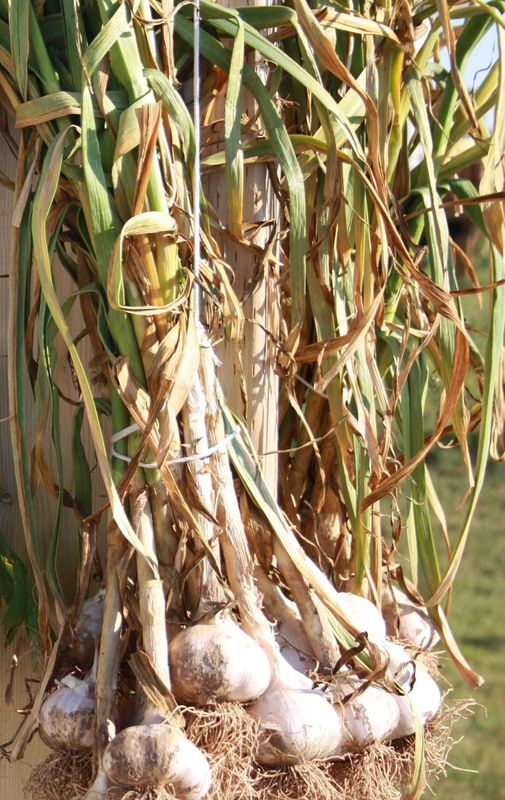 If the bulbs are immature when harvested they will tend to shrivel when cured. If harvested too late, the bulbs may be discolored and the outer papery covering will break down exposing the individual cloves. Garlic is ready for harvest when the cloves are fully segmented but the bulb is still tightly encased by an intact outer skin. Given wet weather and increased humidity, curing and postharvest storage are critical in the production of quality garlic. Garlic must be cured for several weeks prior to storage. Under very humid conditions, the bulbs can also be cured on racks in forced air dryers at low temperature and low humidity. The bulbs must be thoroughly dried before placing in long term storage. Mold growth can be a problem if garlic is not cured properly before storage. When properly cured, garlic keeps well under a wide range of temperatures. Store cured garlic in open-mesh sacks in a dry, well-ventilated storage room.